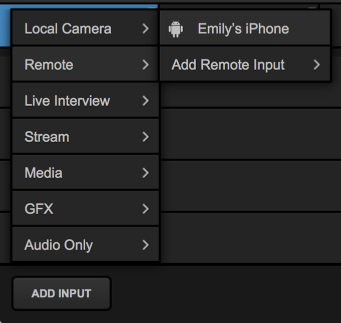 Livestream Studio allows you to use your iOS device as a remote camera source. You will need a Livestream account in order to use this feature. Download the Livestream iOS application. Connect your iOS device via Wi-Fi to the same network as your Livestream Studio system. Open the Livestream iOS application and log into your Livestream account. Don't have a Livestream account? Tap Continue with Email, then Sign up. This will create a free account on Livestream and grant you access to the mobile app's features, including Studio Remote Camera. Keep in mind a free Livestream account does not allow you to go live to the Livestream platform unless you pay for a Livestream plan. Tap the menu icon in the upper right, then tap the gear wheel. This will open the application settings. Tap Studio Remote Camera and make sure Studio Remote Camera is enabled. 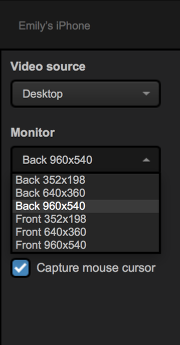 Then select the blue Livestream Studio Remote Camera bar. In Livestream Studio, go to the Inputs tab in the lower left corner. Select Add Input > Remote. If your device is connected to the same access point as Studio, it will appear as an option for you to select. If you click on the gear wheel next to your remote iOS source, you can change settings such as which camera is being used and at what resolution.